New Richmond Exempted Village School District's excellent record keeping has earned it a second consecutive Auditor of State Award after a financial audit by Auditor of State Dave Yost's office. "Based upon your recently completed financial audit, it gives me great pleasure to inform you that the New Richmond Exempted Village School District has received the Auditor of State Award," Yost said in a letter to Teresa S. Napier, NREVSD chief financial officer /treasurer. "Clean and accurate record-keeping are the foundation for good government, and the taxpayers can take pride in your commitment to accountability." "l have been entrusted by the State of Ohio and the citizens of the New Richmond Exempted Village School District to insure financial matters are carried out accurately, openly, and ethically," said Napier. 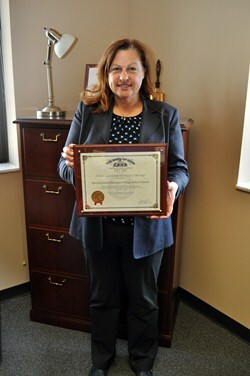 "I take this responsibility seriously and I am so very proud to be awarded this award from the Auditor of the State of Ohio for two consecutive years. Financial accuracy and transparency are vital to continue to earn the public's trust." The entity must file timely financial reports with the Auditor of State's office in accordance with GMP (Generally Accepted Accounting Principles). The audit report does not contain any findings for recovery, material citations, material weaknesses, significant deficiencies, Single Audit findings or questioned costs.